Please return to this page periodically for updates. NEH requires that we have personally inspected any rentals that you will occupy, which is why we provide this list, and we ask that you choose one of these places. You also need to book ASAP in April, otherwise we might lose the reservations. July is a very popular month in Oaxaca because of the Guelaguetza dance festival. We only list places that have been approved by former NEH Summer Scholars. We only list places that are within what we consider to be a fairly safe zone; still, it is always good to walk with a buddy and/or take a taxi at off hours. We also offer here a range of comfort levels and prices. So, once you have been selected to participate in the summer institute, please look through the list and email Stephanie which place you prefer. She will keep a first-come, first-served list of preferences. It is good to give her two or even three choices, and she will try to accommodate as many first choices as possible. Also let her know if you are willing to share. You will save money if you share. Also, we do not have 30 individual apartments. Some are two-bedrooms, meant for sharing, and rooms at the Parador are probably only cost-effective if shared (these are one-bedroom units with two double beds). Stephanie will provide the landlords with your names and dates (it is helpful if you can book your flight ASAP in early April, too). An ideal arrival date might be July 3 (to give you a couple of days to adjust) and an ideal departure date might be August 2. Landlords will want to know the actual dates, however, so please send copies of your itineraries to Stephanie to share with landlords. Stephanie has provided deposits for the four units at Casita Camila; you won’t need to reimburse her for these, as the owners will reimburse her. The caveat would be if there were any funds withheld from the deposit as a result of damages (which has never happened); in that case, Stephanie might ask for you to cover any funds not returned to her for your deposits. If you are checking a place against the map, here are the preferred parameters: go west no farther than Díaz Ordaz (exception: Casa Girón); do not go farther north than Niños Héroes (exception: Xochimilco is a pleasant little neighborhood and can be nice, but you’d probably want to go home from evening events in a taxi, just to be safe); I would not go east farther than Mártires de Tacubaya (exception: Jalatlaco is a pleasant little neighborhood, and a couple of the streets in Jalatlaco are a bit east of M. de Tacubaya); I would not go farther south than Vicente Guerrero (exception: some people feel okay staying in units on Arteaga). This is on Macedonio de Alcalá, which becomes a pedestrian-only street one block south of the Parador. These “suites” have have a good sized kitchen with dinette (plus dishes, tableware, pots, and pans), living room, bedroom with two double beds, one bathroom with shower. Sharing is a possibility and will make this more economical. Not super elegant, but the services are nice. Small pool. Daily maid service with regular change of sheets and towels. A rooftop sink and clotheslines for washing your clothes (but you’ll find a service laundry two blocks away, if you prefer). Bedrooms have TV with cable. Wireless internet is included in the price of lodging. A safe for storing valuables in the bedroom closet. The location is quiet and peaceful. The 2014 rates were about $1,300 USD for a unit shared by 2 people ($650 USD each). Stephanie Wood stays here with her husband and Ron and Jeralyn stay here. We often have little pool parties in the evening to unwind. The owner has reserved two additional units for possibly sharing by teachers. We have reserved two apartments here, a one-bedroom ($865) and a two-bedroom ($1,035). Follow the link at VRBO to see more photos. The location is a straight shot down Independencia to our seminar room; perhaps about 8 blocks to walk. While Independencia is a busy street, the interior of this 250-year-old brick house is a quiet little oasis with a garden and a fountain. Calle Pino Suárez #517, and not a long walk to San Pablo (our classroom site). This small family B&B/hotel is a half-block south of the Llano square and about a 10-minute walk north from the Zócalo (main square) in Oaxaca. There are a couple of units with small kitchenettes. Call and ask for Crystal. The studios with kitchenettes are $830USD/month for a unit with free Internet, private bath with hot water, and free breakfast. Rooms face onto little patios with plants. Breakfast is provided in one of the patios. 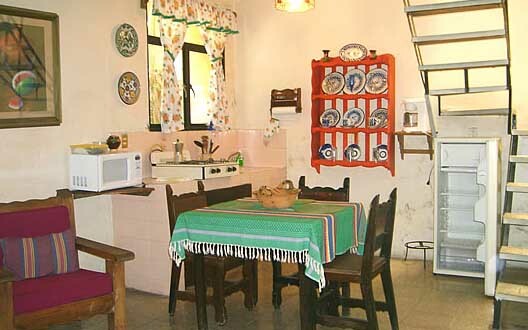 Rooms with private bathrooms, with access to share cooking in a communal kitchen, cost $650 USD/month. The atmosphere is just a little funky for the price but we have had several people who LOVE this place. The website, in Spanish, includes lots of photos of the interior spaces. The street is busy, but one doesn’t feel the noise of hubbub of the street once inside the hotel spaces. The family that runs this B&B is said to be nice. Please let Stephanie know if you are going this route. Even once she knows this is your preference, she may instruct you to work directly with the folks at Las Mariposas to get your reservation. On Macedonio de Alcalá, a block or so north of the Parador, this place has somewhat lower prices than the Parador, and is accordingly a bit less elegant. A studio apartment with one person in 2014 was renting for 6900 pesos (about $460 USD), and with a couple or two people sharing, the rent was 8900 pesos (about $600 USD, or $300 USD each). Be sure to ask for a unit with a kitchenette (comes with cookware). They also have hotel-type rooms without kitchens, probably not what you’d want. You can read reviews on TripAdvisor. It fills up quickly in summer months with people coming to study Spanish at Lucero Topete’s language school nearby. It does have a small pool, and the locaction is walkable (11 blocks total from the classroom site). There is a bar that was large enough to accommodate impromptu gatherings of NEH Summer Scholars at the end of a long day, where we could relax, and they gave us discounted drink prices (at least in 2010 and 2011, we didn’t try it in 2014). Wireless Internet. Please let Stephanie know if you hope to stay here. Even once she knows this is your preference, she may instruct you to work directly with the owner (Abraham Ordoñez Tomacelli) to get your reservation. We have one apartment reserved here, good for an individual or a couple. We need to get a quote on the rent. It will include breakfast with the family who lives in the complex. Breakfasts are said to be delicious. The family speaks Spanish, which is great for someone who’d like to practice Spanish. Economical with some charm. Teachers from 2011 and 2014 enjoyed this place. The location is slightly more removed, but think of it as an opportunity to get some healthful exercise in your walking to and from the classroom! The location is on Calle Matamoros (no. 502) between Unión and Crespo. It would be best for women to walk this route with a buddy at night. 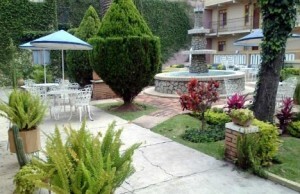 This family-run business (Luis and Ita are your hosts) includes both hotel-like rooms and small furnished apartments. We have not reserved anything for you here, but you are welcomed to check to see what might be available. Someone from our group in 2014 got a unit with a kitchenette for $700 USD for the month. You should inquire to see what is available for our dates. The location is just east of the Santo Domingo Cultural Center and a comfortable walk to San Pablo (our classroom space). Check the TripAdvisor review from Jan. 2011 — quite positive. This super clean and charming B&B has some apartments at multiple sites in central Oaxaca and in the historic neighborhood of Jalatlaco. If you want to go here, you will need to make your own arrangements. Ask about the Estancia Valencia and the Encanto Jalatlaco. Here’s a page with details about specific rooms. Someone in our group in 2014 asked about a monthly rate for their apartments, but only got a quote of $400/week, which would be $1600 USD a month. Please let Stephanie know if you are seeking this option and what kind of arrangement you make with the owners (cost, and for how many people). It is pretty, but high priced. This no-frills, one-bedroom apartment probably best for an individual (male, given that it is slightly remote) or a couple (one matrimonial bed) rented for $380 USD for a month in 2014. It is on the edge of Jalatlaco, a fun little neighborhood. We have not yet reserved it. If you want it, you should follow the link yourself. The apartment is very near the celebrated restaurant, El Biche Pobre. Calzada de la República is a busy street, and the morning and evening commute involves some traffic, but the apartment is on the interior of the lot, and Oscar says it is therefore fairly quiet. Reviews are largely positive. Oscar is attentive and even meets people arriving by bus (his place is not far from the ADO station, where first-class buses from Mexico City arrive). Please do let Stephanie know if you are going after this place. On Calle Arteaga between Melchor Ocampo and Xicotencatl, this is the only furnished apartment building south of Independencia on this list of recommended lodging sites. Nothing specific is reserved here yet, and if you want to rent an apartment here, you will do this on your own. It is a place with big units of three bedrooms, good for a sizeable family. It’s a safe street for two or more people walking together, but wouldn’t be a good location for a woman walking alone at night. You can read the mostly positive reviews on TripAdvisor, which discuss quirks such as extra charges if you have a three-bedroom unit for $600 USD/month and then host some extra visitors. Stephanie has stayed here in a three-bedroom unit with her family (four of us), and it was fine and economical. It would be about 5 blocks to walk north to our classroom location from these apartments. A You-Tube video shows a series of photos of this building and interior spaces. For reviews, see TripAdvisor. For more information write: villamaria22@hotmail.com Please let Stephanie know if you are going to try to stay here. In 2011, three bedroom, fully furnished apartments cost about US $3000 for the month of July, or about $1000 USD per person if shared (although the one in the master suite might be asked to pay more, and those with the two smaller bedrooms pay less). We have not reserved anything here yet for 2015. These apartments are among the most spacious and have the highest standard we have found, but they are also the most expensive, and the walk from our classroom is a fair bit farther than the others. If you choose this place, you will definitely want to share and take advantage of having companions for walking back and forth from our classroom and our excursion drop-off point. Please let Stephanie know if you are hoping to share one of these big apartments. She can try to help you find someone with whom to share and she would be willing to try to help you get the reservation, if necessary. One last option for apartments is this group of apartments that we have not reserved. One of our group members stayed here in 2014 and had no complaints, but our logistical assistant visited the place in the hot season and found it stuffy. But we will be there in the cooler, rainy season. If you wish to stay here, you would want to get in touch with Carmen directly to get the address, rent for July 2015, availability, etc. So, if you want to follow up, be sure to explore arrival and departure dates that will work for you, and see if they work for her. Please let me know if you need help contacting her. This budget hotel is five blocks from our classroom. 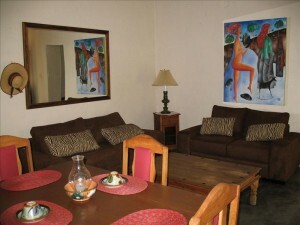 Perla Jiménez offers a bedroom with a shared bathroom and breakfast for 2500 PESOS for the month. This hotel is recommended by a former NEH Summer Scholar, Marisa Silva. It is within the zone that should be safe, and Marisa felt comfortable there. Another former NEH Summer Scholar, Pearl Lau, returned to Oaxaca and stayed there last summer. Please let Stephanie know if you decide to stay here and if you need help getting a reservation. We have not yet reserved anything here. As a rule, hotels, charged at a daily rate, are terribly exhorbitant. But this one is an exception. This is another exception. One of our folks stayed here in 2014 and seemed happy with it. A room is $550 a month for one person and $580 a month for a two; the apartment is $800 for one person or two (the costs as of 2014; not sure what they will be fore 2015). Ask the B&B about availability, the cost, and let Stephanie know if you need help getting a reservation here. We have not yet reserved anything here. LAST RESORT. We have not personally examined these listings. So, they are not NEH approved. 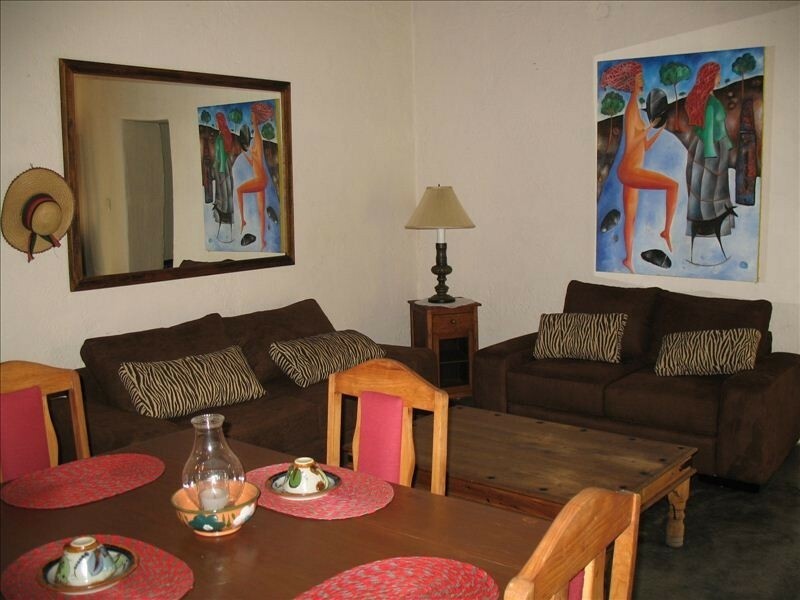 There are a number of apartments and suites in Oaxaca offered through the airbnb website. I think some of the apartments mentioned above (such as Oscar’s) are also listed on airbnb, but the rates may be higher. Be sure to ask for a monthly rate (the nightly rates would add up to be too much), and take careful note of the exact location (some will require taking a lot of taxis, although a taxi only costs about $4 USD). I can also help you assess whether a location will be walkable and safe. Many are outside the zone we consider safer. https://www.airbnb.com/rooms/1752450; “Casa de Benito,” this is a one-bedroom for $2020 USD per month, just one bed, so it would be hard to share; it’s on a quiet little square between the Parador and the Villa de Campo; seems expensive; one would need to check for July availability. Please let Stephanie know if you find and book something through airbnb. Hostels are another option for those really trying to make the stipend stretch. Often, you can get by in a hostel, on a per night basis, for a total of about $400 for the month. 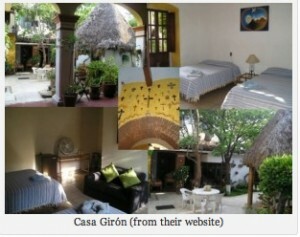 You can look for a hostel (in Spanish you will also see the word “hostal”) in TripAdvisor: http://www.tripadvisor.com/Hotels-g150801-c3-zff26-Oaxaca_Southern_Mexico-Hotels.html. The Luz de Luna is very well located for our classroom location, and it is fairly highly rated. I had a rave review from one of my students for the Oaxaca Learning Center (rated #5 in TripAdvisor). It has a dimension to it that teachers will especially like — helping disadvantaged youth with their education. Azul Cielo (rated #1) is about a 7-block walk south from our classroom, but Arteaga is just a bit sketchier (better for lone men walking at night than for lone women). Neighborhoods to the south of Hidalgo are generally of this nature. Going north, less so. Hostel Don Nino is up near the Llano park, which is okay, but the reviews are mixed. Please let Stephanie know if you are trying to get into a hostel. If you decide to arrive early or stay late and study Spanish at the Instituto Cultural de Oaxaca, that organization might be able to help you line up a home stay, which could be economical. Please let Stephanie know if you find a homestay. We have more leads on apartments farther away. So if you are running out of options, do not despair, Stephanie will try to help you find something. But we have really scoured the center of Oaxaca for the safest places and in a price range that could work with the stipend you will have.